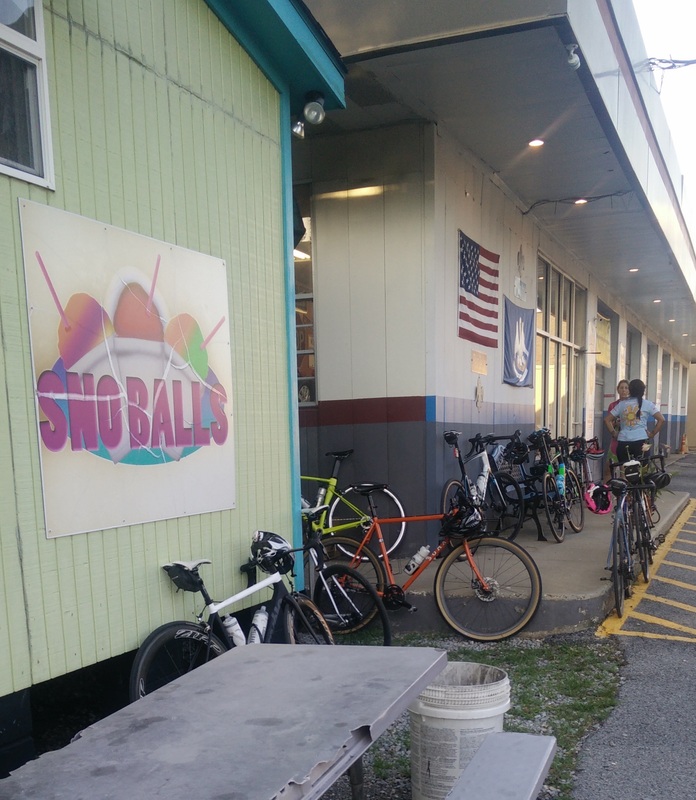 New Orleans has a small but welcoming cycling community, as well as some biking infrastructure. I recommend cycling with local clubs, and being comfortable with navigating in traffic. My experience flying with a bike here. 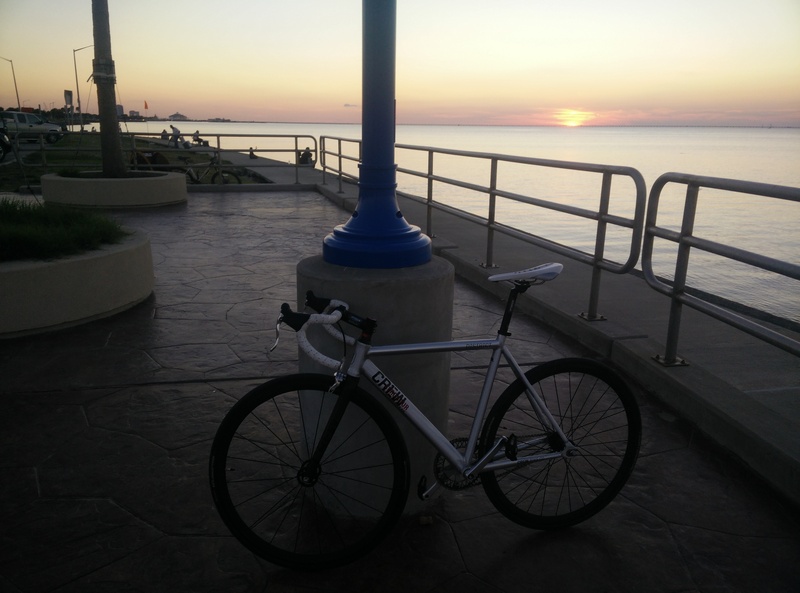 I spent a week in New Orleans to attend a conference and decided to bring my bike! My family and coworkers were worried about my safety, and a colleague urged me to look up biking in NOLA. A recent news article turned up in my search: “New Orleans cyclist shot while riding.” While worrisome, this was an unusual incident, and my Google search led me to find local cycling clubs. I had to train for my upcoming cycling tour, and considered spinning classes at TOUR (currently on Groupon). However, I wanted to see the city and reassured others and myself by saying that I would not bike alone. I was surprised at how easy it was to bike around NOLA. There are some recently made bike lanes, and several one-way streets. I did not find cars to be aggressive but I did hear that taxi drivers can be a problem. Experience helps with biking around and in between cars, doing shoulder checks, and approaching intersections with caution. You may want to consider driving to the routes if you are not used to commuting in traffic. Commuters in NOLA treat red lights as stop signs. On a safety note, do not bike without lights at night. A number of streets are made of concrete, I suggest wider tires for more comfort. Look out for potholes! A popular training ride is a loop at the Lakefront from the New Orleans Museum of Art (NOMA), seen here. You can get to NOMA by taking Esplanade Avenue, a bike-friendly paved road shaded by trees. By NOMA is City Park, which has a short path. The Lafitte Greenway links parts of the city, note that locals are wary of taking it at night. Go house viewing along St Charles Avenue (has a partial bike lane but use cautiously) and relax in Autoban Park (check out the Tree of Life!). Avoid biking in the French Quarter since it is crowded with tourists, especially on the weekend. Contact clubs to ask to join as a guest, and follow their social media to be updated on their rides (the websites might not be current). Semi-Tough Cycling Club Fast group. They have a social ride on Friday evening called Sugar Rush. Crescent Cycle Club Fixed gear club. Other bikes were welcomed on their night ride. Nola Social Ride and Get Up n Ride Fun rides, relaxed pace. Rouler They host fast lunch rides. Rouler Cafe and bike shop in the Central Business District. Dashing Woman-owned bike shop. Off Esplanade Ave.
Bayou Bicycles Largest in the city. Along the Greenway. I stayed at a boutique hotel, International House Hotel, as well as the Renaissance Arts Warehouse District Hotel. I checked with both hotels beforehand about bringing the bike (my family was convinced that there would be a problem). They both had storage rooms but I brought my bike to my room most of the time. I would recommend the Renaissance, located near the Convention Center with simple access to local rides. I suggest staying at a corporate hotel as they potentially have larger elevators, hallways, and rooms. 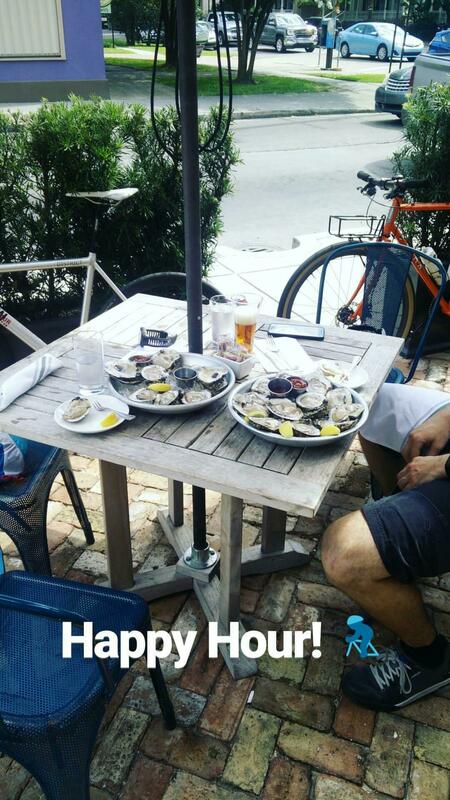 Look for restaurants with a patio outside of the French Quarter if you wish to keep an eye on your bike. You cannot go wrong with food in this city. Snoballs at Bubby’s Snoballs (247 Harrison Ave), near the Lakefront. Or anywhere really. Beignets at Morning Call (56 Dreyfous Dr), by NOMA. Open 24/7, cash only. The Backyard for pub fare near the Lakefront. Urban South Brewery – located in a warehouse (room for bikes!). 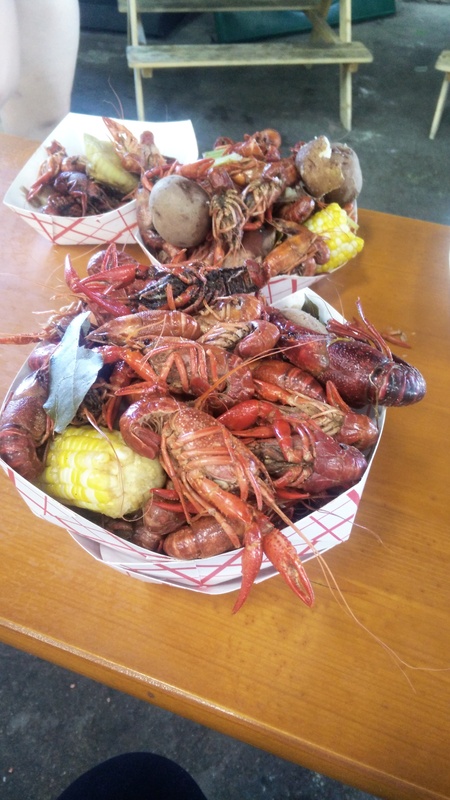 Crawfish boils on Thursdays (check their Facebook page). They sponsor a local cycling team. Pizza Delicious, “#1 pizza in New Orleans.” Bike parking and patio. Kenton’s for happy hour oysters. More happy hour oysters around the city. I was in New Orleans from May 22 to 28, 2017. It was cooler than usual for that time of year. The lakefront is always windy (yay resistance training), and there was a breeze during my rides, so I did not feel too hot. Snoballs help. Bring lots of water. Bike Easy Commuter guide and map. Google Maps On the top left menu, click Bicycling for bike-friendly streets and paths. Finally, I am glad I brought my bike! I was able to cover more of the city and meet some cool people. I will definitely look into meeting up with cycling and running clubs during my future travels.